The Bulkley Valley was once a remote part of British Columbia. This remoteness did not stop a hardy group of farmers from starting to dairy farm in the region at the turn of the 20th century. This enterprising and hard working dairy community contributed greatly to northern development. Production of Cheese in the Armstrong area has a long and storied history. 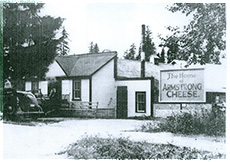 From a small cheese factory, the Armstrong Brand became a national brand and was twice selected as World Champion Cheese. Learn about the rich history of this cheese. Comox Valley was settled by loggers, coalminers and fishermen. To feed this growing population, pioneers cleared land and began dairy farming. Milk was shipped directly to consumers. Farmers organized and built creameries and milk processing plants to meet the needs of the growing population.